I have a love-hate relationship with granola. I loveeee eating it, but I don’t love that a measly 1/4 cup serving often has 200+ calories, or that I have absolutely no self-control around an open package of those crispy clusters. I don’t even need yogurt– just hand me a bag of granola and I can go to town. My favorite store-bought granola has to be Trader Joe’s “Just the Clusters.” There’s a chocolate almond kind and a vanilla almond kind and they’re both really good, with surprisingly short ingredient lists. The best part is that they’re packed with huge chunks of granola, not just broken little pieces. Much clusters. So yum. (<- How my roommate and I started talking last year when we were way too tired.) I highly recommend trying it if you live near a Trader Joe’s. But if you don’t happen to live near a Trader Joe’s or prefer to make your own granola, no worries. I set out to recreate that incredible chocolate almond granola, clusters and all, and I have to say…the homemade kind is even better. 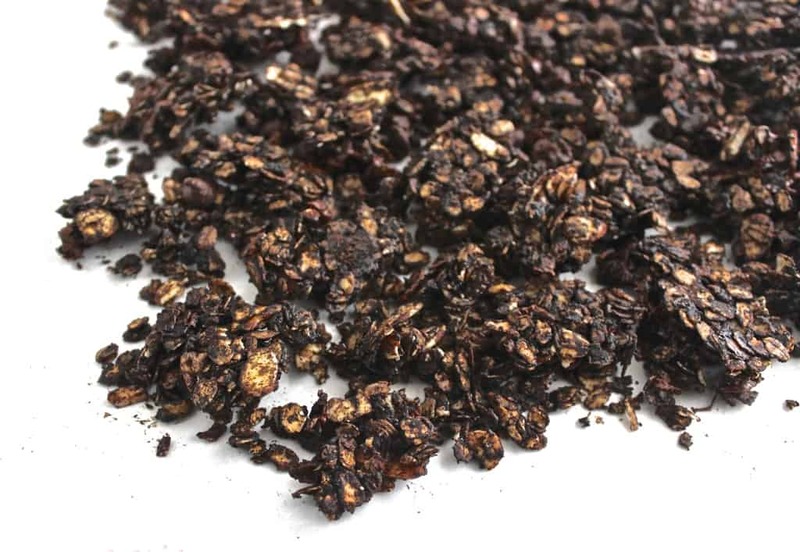 From start to finish, you can have your granola mixture stirred together, baked, and out of the oven in less than 25 minutes. 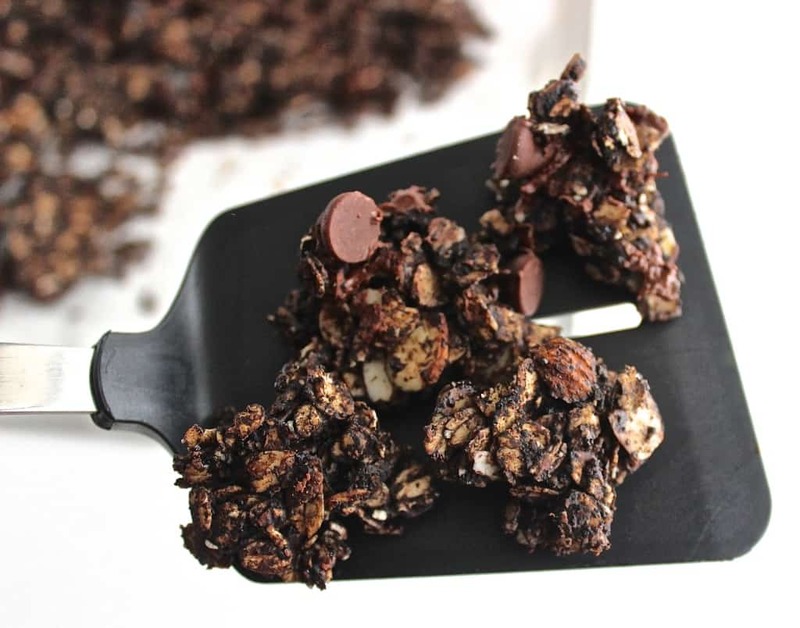 After it cools, toss in a handful of chocolate chips and be prepared to satisfy your deepest chocolate cravings for less than 200 calories per serving (a big handful of clusters)! 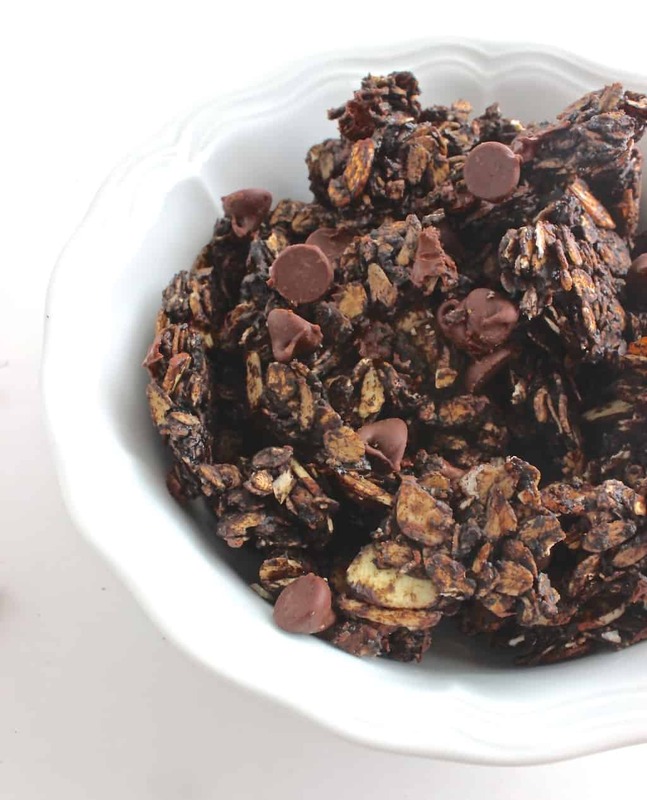 Double chocolate almond granola– much clusters, way crispy, so yum. 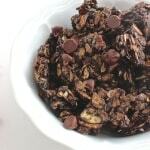 Skinny Double Chocolate Granola- a decadent and healthy treat with less than 200 calories per serving! Preheat the oven to 350 degrees. Line a large cookie sheet with parchment paper or a silicone baking mat. Set aside. Combine oats, cocoa powder, brown sugar, and salt in a large bowl. Add canola oil and honey and stir to coat oats completely. Add slivered or chopped almonds and stir just to combine. Spread onto parchment or silicone-lined baking sheet. Bake for 16-18 minutes without stirring. Remove from oven and allow to cool completely, and then add chocolate chips. Break into large clusters. For best results, either store covered at room temperature for up to 10 days, or freeze for up to 3 months. 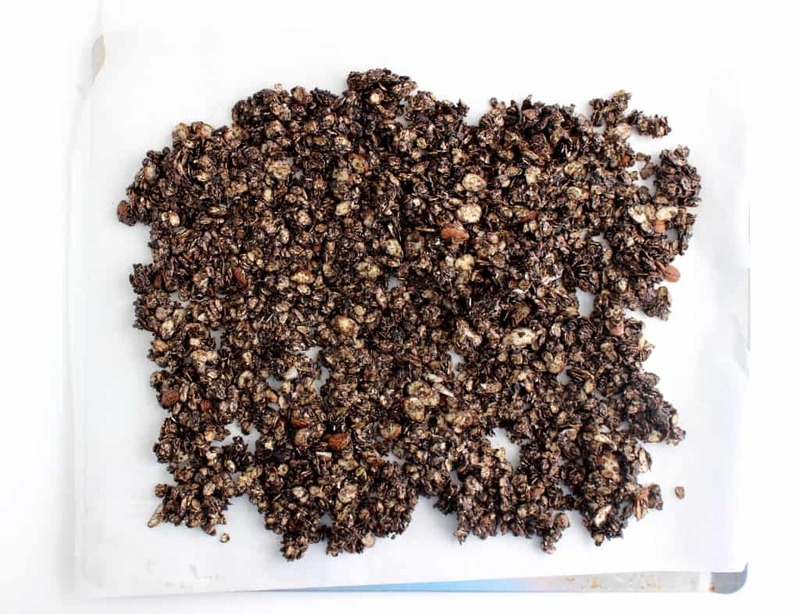 Refrain from stirring the granola once it is on the baking sheet, only breaking it apart into large pieces once it is completely cooled. Press granola down with spatula once it comes out of the oven to help it clump together. The espresso powder doesn't make the granola taste like coffee. It just enhances the chocolate flavor, but is completely okay to leave out if you don't have it on hand. 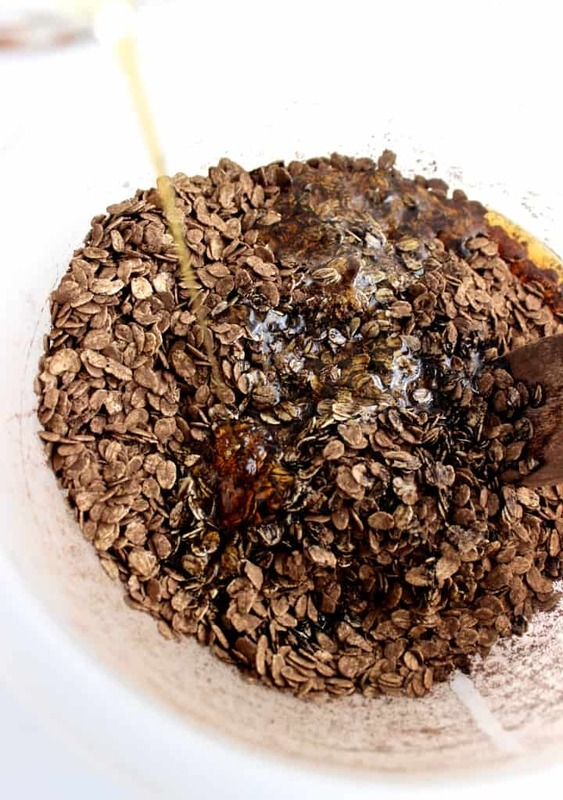 Have you tried making your own granola? What’s one of your favorite things to buy at Trader Joe’s? Besides their granola cereals, I love their dark chocolate peanut butter cups and their tomato basil hummus. How do you like to satisfy your chocolate cravings? Usually with ice cream…but anything that’s extremely chocolate-y works for me! I am exactly the same with granola. I love it, but you get so little for so much calories. This looks like it would be totally worth the calories though. Double chocolate anything is a must-have! My favorite thing to get at Trader Joe’s has to be their cottage cheese.. no shame. It is truly the best! I really enjoy making homemade granola, also. The best part is putting anything you want into it. I love making homemade granola! Not only is tasty and can be a whole lot healthier than store bought, but the smell while it is baking is like no other! Even if I never got to taste baked goods, the smell of them in the oven would be worth making them! Double chocolate. Need I say more? My favorite TJ find (besides their wine) has got to be their cookies n’ cream cookie butter. That stuff is dangerous for me! I’ve seen that before at Trader Joe’s! I’m generally not a huge fan of sweet nut butters/cookie butters for some reason, but I LOVE cookies ‘n’ cream and have no doubt that it’s pretty addictive! Ok I know we’ve discussed this before…I’m not a big “granola for breakfast” girl but this would be a KILLER dessert 🙂 nom!! HAHA I love that we’ve had conversations like this before 🙂 Granola’s definitely more of a snacky food and dessert for me, too, since I’d probably have to eat a ton of it to be a whole meal, which mighttt not be the best. I’m totally with you, I can eat an entire bag of granola without a second thought. I’ve never made my own granola but I like making at home granola bars 🙂 Best thing to buy at TJs is the cauliflower rice – totally bought into it! I have a few pieces of dark chocolate which helps satisfy my sweet tooth. Ooh I’ve seen recipes for cauliflower rice before but haven’t ever noticed it at Trader Joe’s! They have so many great freezer options. I love making my own granola but this chocolate one is totally calling my name! I love making granola and this one looks delicious! Anything “double chocolate” sounds pretty perfect to me. Ooh, I haven’t tried their sweet potato fries or dried mandarin orange slices. Sounds yummy! Your friends sound wonderful! And seriously- how do they have “extra” granola? This was gone in my house in about 2 days! There’s a Trader Joe’s near where I grew up, but we never really went. (Though we still have a couple of their big reusable bags that we use all the time!) I want to go back some time as an adult and see what all the fuss is about. 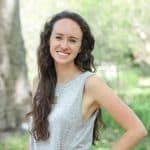 I am the same way – give me plain granola (especially chocolate! ), and I don’t need anything else! Although, my new favorite way to have it is out of hand with a glass of milk. Kind of like the traditional way of in a bowl, but it doesn’t get soggy. Ah, I have the same love-hate relationship with granola too. I seriously could eat an entire box in one sitting…which is why I don’t eat it very often. But it’s soooo good and this recipe looks incredible! I’m glad it’s not just me who can’t stop eating granola! I try not to eat it toooo often either, but I love making it for special occasions or to give away as a gift! Wow, this looks like dessert, but knowing me, I could definitely justify having it for breakfast. 🙂 I think I need to make granola very soon, and I think I know what kind it will be! I buy TJ’s Pound Plus chocolate all the time but have never tried their granola. Make mine homemade. This one looks fabulous – more like a snack than breakfast, which is fine by me. YASSS you’ve been killing it with the chocolate stuff lately! I need cluster-filled granola! I actually get upset when it is all crumbled away before I get a chance to eat it! You’re so inventive Liv, and I love the recipe! Ahhh!! This looks amazing! Love that you added chocolate chunks!! …and I hear ya on the granola/ high calorie issue… like for real! Lol, yours is SO much better! I might have to try this. I have an obsession with Granola. I also really love no bake peanut butter bites.